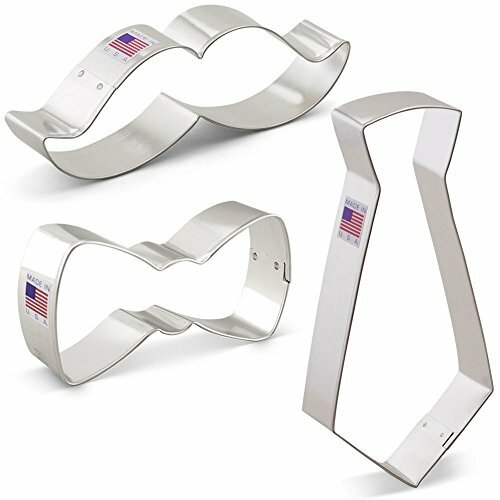 Bow Tie - 4" x 2"
Mustache - 1.875" x 5.25"
Neck Tie - 5.875" x 2.875"
For over 25 years, Ann Clark has been the brand of cookie cutters that families and baking professionals have trusted. The company was founded in 1989, when the artist, Ann Clark, had the idea to transform her popular pig shape ornament into a cookie cutter. Blending her unique folk art designs and custom hand painted recipe cards, Ann launched her first line of cookie cutters and Ann Clark Ltd. was formed. With the help of her family, Ann's business has grown from a small home business to the largest U.S. Manufacturer and most well recognized brand of cookie cutters. Today the company is led by Ann's son, Ben, who upholds the Clark family's standards for excellent design and quality American-made products. At Ann Clark, we know cookie cutters and the professionals who use them. Careful thought is given to each design and how our customers will use it. We don't want any part of your cookie to be too thin, use a material that will dye your cookie or melt onto a freshly baked one. We test our products yearly to ensure that they are food safe. Every cookie cutter Ann Clark makes is made out of tin plated steel in a rigidity of metal that is strong enough to easily cut through cookie dough and other soft foods but is flexible enough to permit us to create the detailed shapes our customers love. The techniques we have developed over three decades of manufacturing have set us apart, permitting us to create modern, complex shapes with crisp corners and intricate details. LITTLE MAN 3 PIECE COOKIE CUTTER SET - Make a big deal of the man or boy in your life with this cookie cutter set, which includes a neck tie, bow tie and mustache. Perfect for baby showers, 1st birthdays, Father's Day, retirement parties and birthdays. See product description below for dimensions of individual items. MADE IN THE USA & CERTIFIED FOOD SAFE - Our cutters are made from tin plated steel and are manufactured in the USA, right in Rutland, Vermont. We test our products yearly to ensure that they are certified food safe. CARE INSTRUCTIONS / IDEAS FOR USE - Hand wash, and dry immediately, not dishwasher safe. Use as a pancake mold, or for cutting cookie dough, fondant, soft fruits, bread, sandwiches, cheese, or craft clay. FAMILY OWNED - For over 25 years, Ann Clark has been the brand of cookie cutters that families and baking professionals have trusted. Family owned and operated since 1989, Ann Clark Cookie Cutters has grown from a small home business to the largest manufacturer of cookie cutters in America. RECIPE BOOK INCLUDED - Make delicious cut out cookies from Ann's recipes, included with every set. Ateco Stainless Steel Donut Cutter Set of 2 : Ø 2 1/2'' and 3 1/2''.